Germs are everywhere! No matter how often we clean or what types of cleaning products we use. I try not to freak out and obsess about germs at home but there are some places that make me cringe at the thought, places like public rest rooms, playground equipment and motel rooms! It's sad to say but you just never know who or what has touched the things before you or if they were sick so it's often times better to be safe than sorry. Kitchens are a hotbed for germs and other foul microorganisms, but many people are wary of using harsh chemicals to eliminate them from counters, sinks, cutting boards and other cooking tools. Purely Products has created a new gadget that holds the solution. The Pocket Purifier is a compact germicidal light that uses the same UV-C light used to sterilize surgical instruments to eliminate 99.9% of germs that cause colds, and flu, plus e-coli, salmonella, mold, fungus and more in under 15 seconds. The Pocket Purifier is powered by AAA batteries and is priced at under $20. Imagine my surprise when I was recently introduced to the Pocket Purifier. Did you know that desktops have almost 21,000 germs per square inch, phones more than 25,000 (toilet seats have only 49). 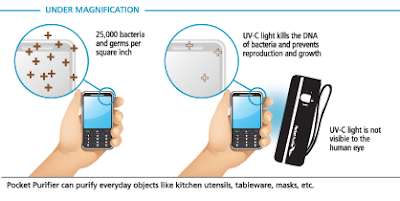 The Pocket Purifier has a built-in germicidal UV-C lightbulb that deactivates the DNA of bacteria, viruses and other pathogens, destroying their ability to multiply. The Pocket Purifier is compact making it perfect for use at home and on-the-go. Of course we all know that we can't actually see the germs that are around us constantly. But by using products that claim to kill 99% of all germs really do make us feel better, Right? Who needs a Pocket Purifier? Clean, healthy living can be like running a germ gauntlet. 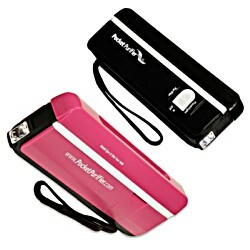 Pocket Purifier™ puts a wall of defense in your hands with its handheld germicidal light. Lightweight and convenient, Pocket Purifier sanitizes surfaces and objects with the same UV-C light that sterilizes surgical instruments. Ultraviolet light and nanotechnology eliminate 99.9% of germs that cause colds and flu, plus e-coli, salmonella, mold, fungus and MRSA (staph). At home, at work, in public, for all high-touch surfaces, Pocket Purifier is the most environmentally responsible way to kill germs without chemicals - hands-down. Tell me WHY you need this product. A special thanks to Purely Products for this wonderful opportunity! I learned that Purely Products donates a percentage of all company sales to support diaperLove™, to help those in need. I follow Being Frugal and Making it Work on Twitter as @svberges. I hope you won, how exciting $50.00 buys a lot of kid meals! Your daughter looks adorable, love the pose! I 'like' your Kidorable Entry. I need this because i LIve with 3 kids lol. I could use this as a super busy SAHM of two little girls! There are so many things that can't really be washed.. like my shoulder bag etc, or things I don't have time to wash right away. because the thought of germs on everything makes me EXTREMELY nervous!! I need this because I take my Kindle, cell phone, and notebook everywhere with me, and I'm sure all 3 are completely covered with germs. It would be great to have this pocket purifier to zap germs everywhere, particularly in public places!! !